Back-pack VHF, FM transceiver. These PRC-638 Radios were built in Italy by IRET for the Iraqi Army, which was then ran by Saddam Hussein. 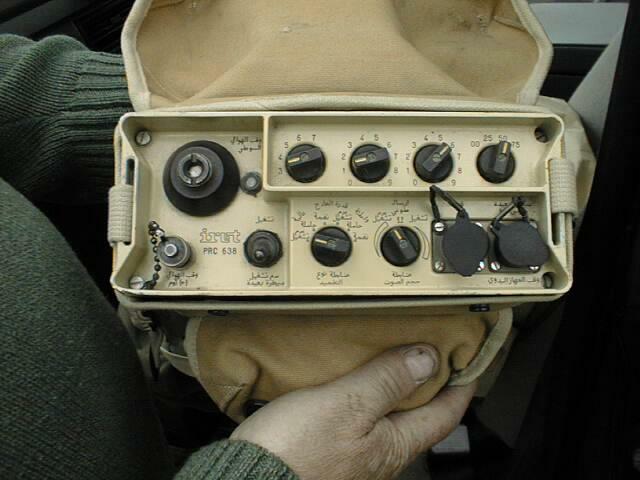 These Radios were captured from the Iraqi Army, features include digital synthesis. Four rotary knobs select the operational frequency of the radio, Arabic text on the dials. Modular construction for easy field service. ATU operates in the receive mode with either 1 or 3 Meter whips. Operates 30-76 Mhz in 25Khz steps for a possible 1840 channels. RF power output is a selectable 4 Watts high or 100mw Low. Requires 12 VDC @ Max 1.5 Amps. This radio is supplied in nice condition, with the canvas bag, but no other other accessores. A real collectors item!